The DNA of extinct birds has shed new light on the formation of the continents in the Southern Hemisphere. Scientists have analysed the life molecules from several ancient creatures to establish an evolutionary history for the ratites, the flightless birds, including the ostrich and the kiwi, found in countries south of the equator. The work not only confirms the geological evidence for the timing of the break-up of the great landmass known as Gondwana about 200 million years ago, it also has major implications for the cloning of extinct species like the dodo. The researchers say the technical difficulties they encountered in isolating and piecing together stretches of old DNA clearly indicate that any projects to bring back to life even recently extinct animals are doomed to failure. Dr Alan Cooper, from Oxford University, UK, and colleagues ground up small chunks of bone from moa, the giant birds of New Zealand hunted out of existence by humans about 200 years ago. From this powder, the team was able to isolate what was left of the DNA in the birds' mitochondria, the energy-generating structures that reside just outside the nuclei of cells. This mtDNA, as it is known, has become a useful tool for studying evolution. It mutates - errors appear - at a steady rate, meaning it can be used as a "molecular clock" to investigate the history of a species. The researchers calibrated the clock by comparing the mtDNA with gene sequences taken from another extinct ratite, the Madagascan elephant-bird, and living animals such as the emu. The results allowed the researchers to trace common ancestry and the probable timings for when groups of animals became separated to evolve as different species. The fossil record shows ratites were a major feature of the animal life on Gondwana, and the pattern of their evolution can therefore indicate the order in which the present-day continents broke off to leave isolated populations of birds. 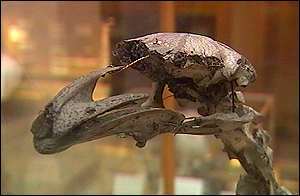 The moa DNA is revealing new information about New Zealand itself, Dr Cooper told the BBC. "We're getting an interesting picture of an island that has continuously broken into two and joined back together again. And that seems to have caused an amazing pattern of speciation and animals," he said. The DNA sequence isolated by Dr Cooper and his team is the largest ever assembled from an extinct creature - 17,000 base pairs in length. Even so, the work proved a major struggle because the DNA was so badly degraded. "When we got to a section of repetitive DNA where a lot of the code is in a junk arrangement it was extremely difficult to sequence through it. A large part of most nuclear genomes of animals are made of junk DNA and if we couldn't even get through a small piece of only about 1,000 base pairs in length, it's going to be impossible to do it for genomes of the order of billions of base pairs." Dr Cooper said this meant obtaining a complete genome from an extinct creature like a dinosaur to clone it back into existence would prove impossible. "Technical issues aside, the habitats of these organisms have long gone, there're no parents to teach them how to behave and no food for them to eat - it really isn't going to happen." The moa research is published in the journal Nature.